First came the steal, then the transition lay-up, followed by a cup of the ear to the raucous sold out crowd. No, it wasn’t Allen Iverson wowing the adoring South Philadelphia faithful. But the Hall of Famer had a front row seat to see Ben Simmons mimic the signature celebratory gesture amidst an explosive, game-changing run. Whether it was Simmons taking his energy to another level, Joel Embiid looking better and better as the night went on, or the defense keying a historic third quarter, the 76ers got exactly what they needed Monday at The Center, blowing out the Brooklyn Nets, 145-123. With the convincing bounce-back victory, the Sixers leveled their best-of-seven Eastern Conference Quarterfinals bout versus their Atlantic Division rival, in advance of the series shifting to Barclays Center later this week. The Sixers’ 145 points established a new franchise post-season record. For as big a number as the Sixers posted, Brett Brown was most pleased with his group's defense, which tightened the screws in a critical third quarter. "We needed to," said Brett Brown. "I thought that defensively the way the team came out and responded to some first half stuff we needed to fix was a fantastic statement." On the heels of Saturday’s tough loss in Game 1, the Sixers vowed to do better a second time around against Brooklyn. They delivered, and then some, checking just about every box on the list of areas they were hoping to improve. Better spirit? Simmons made sure of it, coming out the gates with a super aggressive approach that helped the Sixers set the tone. 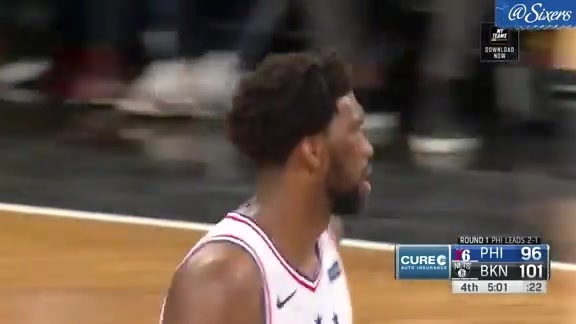 Embiid regaining fluid form? That was an encouraging development Monday, too. The longer he was out there, the stronger, more comfortable, more confident he played. There was also the 3-point shooting. The Sixers canned 9 of 31 attempts from the perimeter after managing only three triples Monday, with JJ Redick (17 pts), Tobias Harris (19 pts), and Mike Scott (15 pts) combining to go 7 of 14 from deep. Perhaps more than anything else, the Sixers locked down on D. At no point did their intensity pay greater dividends than the start of the third quarter. In the opening two minutes of the frame, they forced three turnovers and four misses. The stretch represented the building blocks of a decisive 21-2 run that put the Sixers in control after taking a one-point, 65-64 lead into the locker room. The Sixers’ 51 points in Monday’s third period set a franchise record for the playoffs as well, and tied the Los Angeles Lakers’ fourth-quarter mark from a March 1962 game against the Detroit Pistons for the most ever in NBA history. Simmons notched his second career post-season triple-double, finishing with 18 points, 10 rebounds, and 12 assists. Embiid tallied a game-high 23 points (8-12 fg, 7-8 ft) and 10 rebounds, en route to a plus-26 rating in less than 21 minutes. The Sixers would lead by as many as 32 points before Monday’s encouraging outing came to an end. Most of the starters were removed from the game with 10 minutes to go in regulation. Boban Marjanovic led the Sixers’ bench with 16 points, eight rebounds, an assist, and a block in his 18 minutes of play. The big man started out hot, topping his team with 10 points in the first quarter, and nailing his first six shots from the field. He had a particularly effective touch on his mid-range jumper. Marjanovic has reached double-figures in scoring in each of the first two games of the Sixers’ series versus the Nets. He dropped 13 in Game 1. Mike Scott contributed 15 points, three rebounds, and a steal, including a buzzer-beater that capped the Sixers’ 51-point third quarter. Scott scored 10 points in that powerful period, shooting a perfect 4-4 from the field. Scott was 5-7 from the field, shooting three 3-pointers on the night. After being sidelined the past two weeks with a right quad contusion, James Ennis III played twelve minutes Monay. The minutes were his first since April 3 in Atlanta. Ennis III finished with six points, three rebounds, and an assist. Ben Simmons: big triple-double guy. The Eastern Conference Quarterfinals series between the Sixers and Brooklyn Nets now shifts to Barclays Center, where Game 3 will be held Thursday at 8:00 PM ET. Before departing for New York, the Sixers will hold a practice in Camden, NJ Wednesday.